Natural Cellulosic Leaf Fibres from nature. Hard or cordage fibers are found in the fibrovascular systems of the leaves of perennial, monocotyledonous plants growing in Central America, East Africa, Indonesia, Mexico, and the Philippines. They are generally of the Agave and Musa genera. The leaf elements are harvested by cutting at the base with a sickle-like tool, and bundled for processing by hand or by machine decortication. In the latter case, the leaves are crushed, scraped, and washed. The fibers are generally coarser than the bast fibers and are graded for export according to national rules for fineness, luster, cleanliness, color, and strength. and cordage; decorticated fiber is another class. The abaca fiber has a large lumen and the presence of silicified plates is not unusual. Abaca fiber is unique in its resistance to water, especially salt water, and it is used for marine ropes and cables, although it has been largely replaced by synthetic fibers. Abaca fiber is the strongest of the leaf fibers, followed by sisal, phormium, and henequen; it is also the strongest among the papermaking fibers. It is used for sausage casings and it is the preferred fiber for tea bags because of its high wet strength, cleanliness, and structure that permits rapid diffusion of the tea extract. Agave cantala is a member of the agave family (Agavaceae) that includes sisal. It originated in Mexico and was transported to Indonesia and the Philippines, where it is now produced commercially. The plant grows in a moist, humid soil. The fiber is extracted in Indonesia mechanically by a decorticator (raspador) and in the Philippines by retting in seawater and cleaning by hand or with a decorticator. The cantala fiber is lighter in color than other agaves, and its strength depends on its preparation. Parque Nacional da Serra da Capivara Caroa is a hard leaf fiber, resembling sisal, obtained from Neoglaziovia variegata, a plant of the pineapple family (Bromeliaceae) growing wild in eastern and northern Brazil. The sword-shaped leaves are 1–3 m long and 2.5–5 cm. wide. The fiber is extracted by hand scraping after beating or retting. The fiber is used for cordage and acoustic material. Agave fourcroydes grows in Mexico where it was first cultivated by the Mayans in the Yucatan (Yucatan Sisal). The plant produces for 20–30 years. The lower bottom leaves, which are up to 2 m long and 10–15 cm wide, are cut, machine decorticated, and cleaned. Henequen fibers are white to yellowish red and are inferior to sisal in strength, cleanliness, texture, and length, the other grading criteria. Henequen is grown for local use in Cuba (Cuban Sisal) and El Salvador. Twine, small ropes, coarse rugs, and sacks are made commercially from henequen. Istle is the general name for several agave species and related plants producing short, coarse, hard fibers. The commercial name is tampico. The plants from which the fibers are harvested include tula istle (A. lophantha), jaumave istle (A. funkiana), and palma istle (Samuela carnerosana). They are grown in central and northern Mexico. The fibers are recovered by hand scraping and drying; the palma istle is gummy and requires presteaming. The jaumave istle fibers closely resemble animal bristles in brushes. Mauritius hemp, also called piteira, is obtained from Furcraea gigantea, also a member of the Agavaceae. The plant is mostly grown on the island of Mauritius but is also harvested in Brazil and other tropical countries. The leaves are longer and heavier than those of the agaves. The fiber is extracted by mechanical decortication. It is whiter, longer, and weaker than sisal fiber. Because of its color, it is used in blends. The Phormium tenax plant yields a long, light-colored, hard fiber also known as New Zealand hemp or flax, although it has none of the bast fiber characteristics. The plant is a perennial of the Agavaceae with leaves up to 4 m long and 10 cm wide. The fibers are recovered by mechanical decortication. This genus of the Agavaceae is a perennial also known as bowstring hemp from its use in bow strings. The plant is native to tropical Africa and Asia but are widely grown, mainly as an ornamental plant. It is of minor importance as a fiber plant, even though the fiber is of high quality. The highest grade of S. cylindrica fiber is greenish yellow, very soft and fine, and compares with sisal in strength. The true sisal fiber from Agave sisalana is the most important of the leaf fibers in terms of quality and commercial use. Originating in the tropical western hemisphere, sisal has been transplanted to East Africa, Indonesia, and the Philippines. It is named after the port in the Yucatan from which it was first exported. The sisal plant leaves grow from a central bud and are 0.6–2 m long, ending in a thorn-like tip. 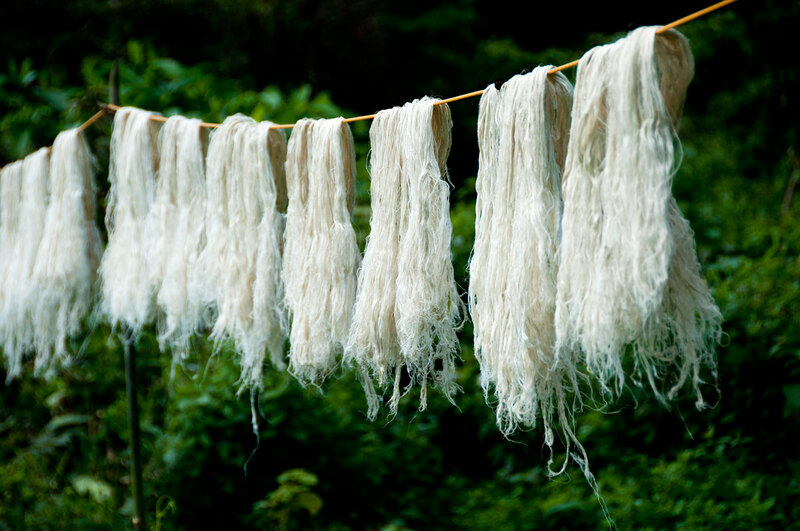 The fibers are embedded longitudinally in the leaves, which are crushed, scraped, washed, and dried. The highest grades are further cleaned with a revolving drum. The growth of the sisal plant depends on water availability; it stores water during the wet season and consumes it during periods of drought. The sisal fiber is coarse and strong, but compared with the abaca fiber it is inflexible, although with a relatively high elongation under stress. It is also resistant to salt water. The principal applications are in a binder and baling twine and as a raw material for pulp for products requiring high strength. A large pulp mill is operating in Brazil based on sisal.